Day/Time: Weekly on Fridays from 1315 - 1700 in Picaardsaal, ETH Hoenggerberg Campus, HPT Room C103. Right above the I on this map. Exam: There is no exam but students must successfully complete the class projects. This is a pass/fail course. Only students who complete the exercises will receive a pass. Students who do not complete the exercises will not receive any grade. Companion course: Electronics for Physicists I (Analog), Fall semester, taught by Roland Horisberger. This course teaches the basics of digital electronics, to provide hands-on experience with using COTS (Commodity Off The Shelf) components to build systems. The course complements the preceding analog course by teaching logic design and digital systems that convert and process analog information. It covers the use of microcontrollers (AVR architecture) and reconfigurable logic (Xilinx FPGA) from basics to physical implementation, including PCB design and surface-mount assembly. The aim of the course is to remove the fear of starting a project and offer the students a first experience at many levels of design. The course consists of short lectures on theory and exercises using two different hardware platforms - a microcontroller board with Universal Serial Bus (USB) interface, and a Field Programmable Gate Array (FPGA) board. In addition the course includes exercises in printed circuit board (PCB) design and PCB surface mount assembly. New: In 2014 we will be using an Arduino uC platform for the first time. 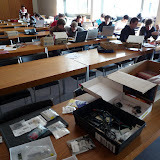 Students should have taken Analog Electronics for Physicists or equivalent and should have had some programming experience, preferably with C. Students (or at least each group of 2 students) need a laptop computer, preferably Windows (7×64 preferred) or Linux (Linux users must largely support themselves…). smd - surface mount assembly for Bronce_V2 and Cooper boards. uc - arduino / ATmega328 - New in 2014.
uc - microcontroller embedded systems programming / AVR32 - For 2013 and previous years. 2 9 Writing your own Arduino application. Pulse Width Modulation (PWM) outputs for producing analog output and controlling servo motor. Discussing quiz on ATmega datasheet and Arduino Sketch. Introducing GPIO and PWM. Electret mics and audio amplifier. During week before lecture: Surface mount assembly; soldering PCBs. 14 22 Semester summary. Project demonstrations: Show your complete snake game or other video FPGA demo using developed modules. Go to cafe for drinks to celebrate summer break! This class is taught by Tobi Delbruck based on material developed by Khaled Benkrid and Tom Clayton at the University of Edinburgh for the logic design using FPGAs part. In 2014, the course was also taught by Alejandro Linares-Barranco, D-ITET guest professor, Univ. of Sevilla. In 2015 and 2016, the teaching assistant is Ilya Kiselev. Students, please provide feedback about how to improve the course. See also ETH Academic Calendar. Refresh if you don't see the google calendar below.